This one will show you how big small can be. 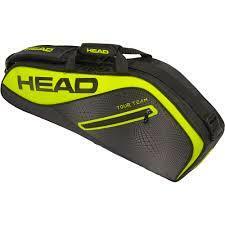 The TOUR TEAM EXTREME 3R Pro, the TOUR TEAM EXTREME range's smallest bag, offers a racquet compartment as well as a front zipper pocket and an inside mesh pocket for the additional extras you need to have quick access to while on the court or on the road. Available in a modern edgy shape, the TOUR TEAM EXTREME 3R Pro and its adjustable shoulder strap can be used on its own or as an add-on to the range's other bags.